It won’t be long until flu season tries to knock you out. Try these tips to punch back. Cough, runny or stuffy nose, sore throat — the symptoms are all too familiar. But you might need some reminders about preventing or treating the flu. Flu season can range from October to May, but according to the Centers for Disease Control and Prevention, it’s impossible to predict what the flu season will be like from year to year. The timing, severity and length of the season vary each year. In the United States, the flu season most commonly peaks between December and March. The CDC Advisory Committee on Immunization Practices recommends that everyone 6 months or older get an annual flu vaccination. However, the committee says that nasal spray vaccines should not be used this season because they lacked effectiveness in the past. Getting vaccinated before flu activity begins helps protect people once the flu season starts. It takes about two weeks after vaccination for the body’s immune system to fully respond. The CDC recommends that people get a flu vaccine by the end of October, if possible. However, getting vaccinated later still has benefits. The effectiveness of a flu vaccine (or its ability to prevent the illness) can range widely from season to season and can be affected by a number of factors. They include the characteristics of the person being vaccinated, the similarity between vaccine viruses and circulating viruses, and even which vaccine is used. In addition to getting a seasonal flu vaccine, people can take preventive actions such as staying away from sick people and washing their hands to reduce the spread of germs. Anyone who has the flu should stay home from work or school to prevent spreading flu to others. Most people with the flu have mild symptoms and do not need medical care. However, to treat the contagious respiratory illness, others might need antiviral medications. These prescription drugs can make the illness milder, shorten the amount of time that someone is sick and prevent serious complications. Studies show that flu antiviral drugs work best when they are started within two days of getting sick. Starting them later still can be helpful, especially if the sick person is hospitalized, has a high-risk health condition or is very sick from the flu. 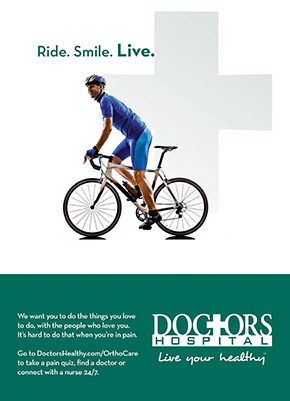 Patients should follow their doctor’s instructions for taking these drugs. Most experts believe that flu viruses spread mainly by droplets made when people with flu cough, sneeze or talk. These droplets can land in the mouths or noses of people who are nearby. Less often, people might also get flu by touching a surface or object that has flu virus on it and then touching their own mouth, eyes or possibly their nose. People can pass on the flu to someone else before they know they are sick, as well as while they are ill. Most healthy adults may be able to infect others beginning one day before symptoms develop and up to five to seven days after becoming sick. Some people, especially young children and those with weakened immune systems, might be able to infect others for an even longer time. The time between a person’s exposure to the flu and the onset of symptoms ranges from one to four days, with an average of about two days. Most people who get the flu recover in a few days to less than two weeks. While anyone can get the flu and serious problems related to the flu can happen at any age, some people are at high risk of developing life-threatening flu-related complications such as pneumonia if they get sick. They include people ages 65 and older, people of any age with certain chronic medical conditions (such as asthma, diabetes or heart disease), pregnant women and young children. The flu also can make chronic conditions such as asthma or congestive heart failure worse. The flu is a good example of how medical myths can get in the way of good medical care. When it’s flu season, take the necessary steps to stay healthy. That includes separating fact from myth. Here are 10 common myths about the flu. The vaccine is made from an inactivated virus that can’t transmit infection. It takes a week or two to get protection from the vaccine, so people who get sick after receiving a flu vaccination were going to get sick anyway. Some people assume that because they got sick after getting the vaccine, the shot caused their illness, but this is not the case. Influenza may cause bad cold symptoms, like sore throat, runny nose, sneezing, hoarseness and cough. But in the United States alone, 36,000 people die and more than 200,000 are hospitalized each year because of the flu. The influenza virus changes each year. Getting vaccinated each year is important to make sure you have immunity to the strains most likely to cause an outbreak. Anyone — even healthy folks — can benefit from being vaccinated. Ice pops can soothe your throat when it’s sore, swollen or dry. They also keep you hydrated, which is key when you fight the flu. Getting enough fluids keeps your mucus thin and eases congestion. Look for ice pops made from 100 percent fruit juice to make sure you get nutrients and not sugar water. You can also make your own frozen juice bars. Turkey has lean protein, a key part of a healthy diet. And although you may not feel like it, eating helps give your body energy to fight illness. Add cranberry sauce for a spike of flavor and comfort-food taste. Since you may not feel up to making and eating a salad while you recover from the flu, try a glass of low-sodium vegetable juice instead. You’ll load up on antioxidants that boost the immune system, your body’s defense against germs. Do you crave a sweet taste? Go with 100 percent fruit juice. 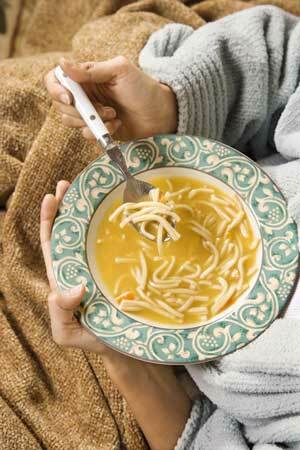 A soothing bowl of chicken soup helps you get the fluids you need and is nourishing, too. While it may not speed up your recovery, some scientific evidence shows that it can help with healing. Like other hot liquids, chicken soup can improve the way tiny hairs in the passages of your nose protect your body from bacteria and viruses. Ginger may help relieve your stomachache and nausea. Some studies suggest it fights inflammation, too. You can add it to other foods, either freshly grated or as a powder. Another option: Have a drink of flat ginger ale. Drink green, oolong and black tea to take in some antioxidants. Breathe in the steam to help clear your stuffy nose. Add a spoonful of honey and a squeeze of lemon to soothe your sore throat. If caffeine bothers you, try decaf or herbal versions instead. Whether you slice it, mash it or eat it whole, bananas are easy on the stomach. They can be a go-to food if you’ve been hit with nausea, vomiting and diarrhea. Bananas, along with rice, applesauce and toast, make up the BRAT diet — often the first foods doctors encourage people to try when they’re recovering from stomach flu and ready for solid foods. Toast or crackers are convenient foods when you’re fighting illness. They pair well with chicken noodle soup, and their satisfying crunch can take the edge off hunger when your stomach can’t handle much. Published on September 1, 2016 in People and tagged front by Kristy Johnson.